STEP 1: Ready to Download! Click the link above to download the client or click here. STEP 2: Join us on the Forums! Get tips, technical support, wingmen and more on the official Epic Space: Online forums. Click here to go to the Official Forums. We now have an official Discord channel! Join us for Product Updates, Events, Community Help, and Developer Support. We've also integrated the marketplace into the Discord server so you can keep tabs on what's posted from out of game. One shared persistent sandbox/universe, shared by the entire world. This rendition of Epic Space focuses on what life would be like in an asteroid mining colony. Epic Space: Online is a massively multiplayer combat sandbox. Pilots join one of two factions in a never ending war over resources across the galaxy. 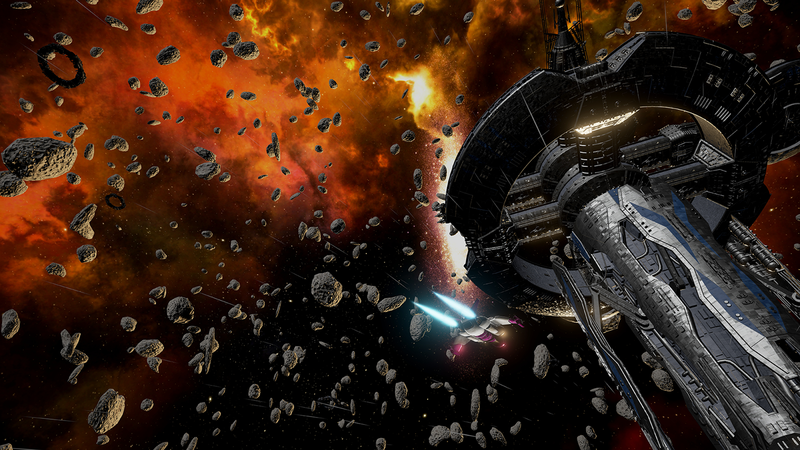 Destroy Outposts, NPCs, and engage in tense ship to ship combat all in one shared universe. Two years have passed since the Consortium launched pioneers into the void of space. The Alliance, which controls Bradford Station, seeks a unique mineral to support earth. The pioneers control Hadfield Station and know the mineral is the key to unlocking the secrets of the universe. You have to decide who's side you're on. Your future depends on it. Your purchase directly supports Epic Space Development. New features added monthly! Choose 1 of 2 Factions.